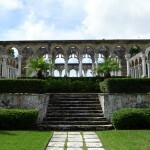 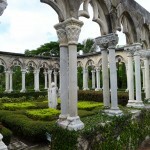 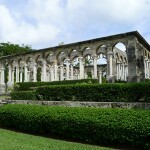 On a rock in The Commonwealth of The Bahamas made famous by the movies lies a cloister from a twelfth- or thirteenth-century French monastery. 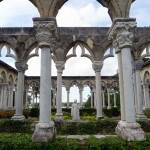 The story goes that the notorious philanthropist and businessman George Huntington Hartford II purchased the pieces of stone from the Montréjeau monastery of the Augustinian order that William Randolph Hearst had brought over from France and stored in a warehouse. 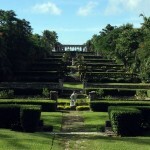 Huntington Hartford also purchased what was known as Hog Island in The Bahamas, renamed it Paradise Island and parked his prized possession there. 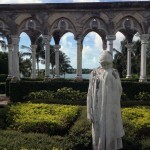 After another flamboyant owner by the name of Merv Griffin owned it, complete with an airline, Paradise Island is now a travel destination for all with The Atlantis Resort and Casino as the anchor piece. 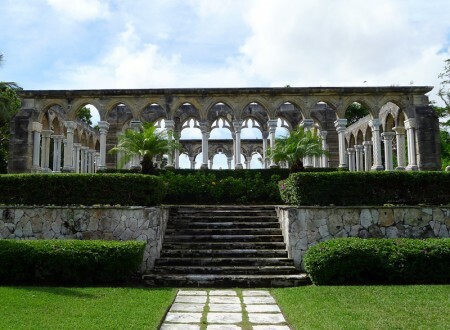 The cloisters sit on the property of the Ocean Club, owned today by Sol Kerzner, like the Atlantis, the One & Only luxury hotel chain and more. 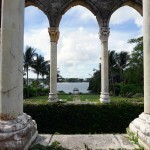 The hotel is featured in two James Bond films: Thunderball (1965) and Casino Royale (2006), and the cloister is prominent in The Beatles movie Help during the hit song Another Girl.